BLUE Dental Bones are made with the finest natural ingredients, have no chicken or poultry by-product meals, are corn, wheat and soy free, and do not contain artificial preservatives, colors or flavors. Large size BLUE Bones are ideal for dogs 50 lb and above. 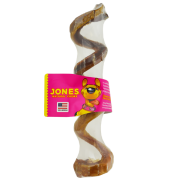 While your furry friend would probably love to eat the whole bag, BLUE Bones are for intermittent or supplemental feeding only. It is recommend that you feed your dog just one BLUE Bone a day. BLUE Bones are not appropriate for puppies and dogs less than 5 lbs. Always be sure to watch your dog while he enjoys a BLUE Bone to make sure he chews it sufficiently.